I have a lot of conflicting emotions about this book. The good: It's a fast read and an interesting story. There's shades of gray, interesting moral dilemmas, attention to detail that makes situations and characters come brilliantly to life, and a main character whose situation is way intriguing. An autistic teenager who's gone to a school for disabled kids his whole life, and now suddenly has to adjust to working at his dad's law firm for the summer. There's a lot of inherent conflict and story in there, and for the most part, the book delivers. I actually really loved reading about his work at the office, as I've been exactly where Marcelo was: autistic teenager brought into the office because of her personal connection with the boss who goes from simple copying to much more complex tasks. I appreciated the detail with which Stork described his work--the challenges, his strengths, the way he could do the work but needed more time for it, his enjoyment at organizing, everything. I was really excited about this book for several reasons, primarily a) autistic protag!! b) Latino autistic protag, which is great, as the usual portrayal of autism is very, very white, c) Latino autistic protag who ponders issues of religion and ethics, rather than making the entire conflict about his autism, and d) I've seen a lot of good things about the book's portrayal of autism and how it immerses you into Marcelo's PoV. Unfortunately, that leads me into the bad, as d) is where the book started chafing at me. I particularly struggled with the writing style and how it conveyed Marcelo's thoughts. This is a difficult thing to criticize, because it's entirely possible that many autistic people do think this way, but to me, his point of view came across as distant, almost mechanical. It read like the book was spoon-feeding "autistic reactions" as if for a neurotypical audience to digest--explaining everything for the "abled gaze," if you will. By this, I'm referring to the way the book is chock-full of lines like, "I like strong smells" and "This is an unexpected response" and "I like this question" and "I do not know what to say to this." I want to believe Marcelo's reactions, rather than be flat-out told about them. It kept me from connecting emotionally. And--as an autistic person who reacts to some things in a very similar manner to Marcelo--I really, really wish I could have felt that connection. This "autism voice" would probably not have bothered me as much if I hadn't already come across it so often. Again, I'm not saying autistic people don't think that way--that'd be preposterous, and I refuse to speak for autistic people as a whole--but I do take issue with how common it seems to be in fiction, as I don't feel it's representative. Some other autism-related parts made me wince, too, like a friend's reaction to hearing about the "internal music" Marcelo has heard in his head for a long time, but has stopped hearing now that he's working at the law firm. "This ability you had before, that was out of this world. A special gift, I don't know. What if it was impossible for you to have it and be a regular person? You don't hear the music anymore, but now you can be flesh and blood like... me, for instance." Another quote: "Marcelo has never felt confusion before. It is painful. There is no peace. No certainty." In both cases, I don't think I need to explain why it bothered me. An interesting note that I haven't seen mentioned often: Marcelo seems to be written as asexual. On one hand, I am pleased with this, as we strongly need more asexual representation, including within the autism spectrum. On the other hand, his asexuality never seemed to be explored as being a legitimate sexuality that exists separately from his autism. I ended up unwillingly reading it as being a "side effect" of his autism, rather than him simply happening to be both autistic and asexual. The fault may be with me, but I would have really appreciated a sign that the author was aware of the pitfalls and stereotypes with regards to linking those two together. As usual, the bad takes far more explanation than the good. I do think this book does a lot of things right, including about the autism: it never portrays Marcelo as ill or wrong; it respects his point of view and reactions; it doesn't demonize or infantilize his experiences at his school; he makes genuine friends and connections; he has hobbies and interests; he is very aware of his privilege as being able to function in a way that's somewhat acceptable to society at large, unlike many of his classmates; et cetera. So I would cautiously recommend this book--it's an interesting, quick read--but with reservations. For a more positive look at the portrayal of autism in this book, check out s.e. smith's review at Disability in Kidlit. 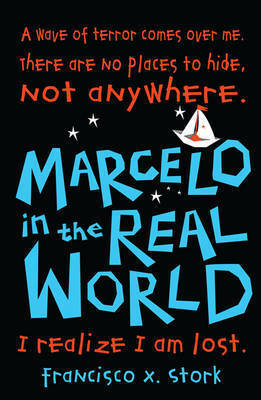 Sign into Goodreads to see if any of your friends have read Marcelo in the Real World. 21.36% "I'm enjoying this, but I don't jive well with the... I don't know what else to call it... "autism voice." I've seen it in other books too. It's like writers writing autistic characters default to lots of straight-up self-aware telling. They'll go, "I do not like loud sounds" or "Figurative statements are a problem for me" as though they're explaining it to someone, rather than naturally *showing* their reactions." I love your take on this book and your additional thoughts on his characterisation so very much! Thanks very much for sharing your thoughts on Marcelo's character. I was wondering how authentic it was and appreciate your point of view. This is very helpful on deciding whether or not to read thank you! !